We discussed about stress recently, although not about its symptoms. Shall we continue from where we left off? Very well. The most common state of mind we experience when we are stressed is anxiety. Depression is another such state of mind. By the term ‘depression’ I mean only a short term state of mind rather than a ‘depressive disorder’. It is possible that a person could experience symptoms of mental illness due to stress, yet only if the prerequisites for such an illness have already been fulfilled within him. It is very rare for stress alone to cause mental illness. Could we say then that anxiety, depression and mental illness are symptoms of stress? Anxiety, depression and mental illness are states that could arise during times of stress, sometimes even simultaneously; anxiety coupled with depression for example. It could safely be said that anxiety is the commonest of these. If anxiety were to surface, the person would have symptoms of anxiety. In the event of depression emerging, he or she would experience depressive symptoms. Likewise, there would be specific symptoms of a particular mental illness, should that be the manifestation of stress. When two conditions emerge together their symptoms would manifest in accumulation. I see. In other words there is no separate list of symptoms of stress. Correct. However some specialists come up with such lists by putting the symptoms of anxiety and depression together. You wouldn’t experience this problem if you were to learn their symptoms separately. So I guess you’re planning on discussing these issues and their symptoms one by one, am I right? And if so, do we start with anxiety? You’re correct. However anxiety, being an emotional state, is more difficult to understand than stress. Let us take an example to illustrate anxiety. Kumudini is a young woman preparing for a job interview. There is an enormous amount of competition for this plum post. Kumudini feels nervous each time she thinks of this interview. She is now waiting outside to be called in, and can feel her heart beat faster and faster. She cannot recall anything she did in preparation for the interview. It is this state of mind that is termed anxiety. Does that mean we experience anxiety only during instances such as before job interviews? No, not exactly. Kumudini became anxious simply thinking of the interview. Although not to the same extent, anxiety is a fact of life that is experienced regularly by practically everybody. We may experience this when showcasing of skills is required, such as in exams, interviews and sporting events. It may even be that chatting with others during a party or a dinner could become a source of anxiety. Experiencing uncertainity promptly makes us anxious. The risk of separation from a loved one or a valuable is especially coupled with anxiety. The illness of one’s child is such a situation. I should say we now have a basic idea of anxiety. What then are the symptoms of this condition? OK. We already know that symptoms such as a racing heart, fearfulness, feeling that your memory has failed you or feeling that one cannot think clearly are associated with anxiety. You can find another list of symptoms in the table below. You may commonly experience some of the following symptoms when you are anxious. Some of these could however arise in conditions besides anxiety as well. Feeling your body and especially your face heat up. Your face may appear flushed and pink if you are light skinned. I think I should keep this table close by and go through it again and again. Aren’t such symptoms also termed ‘tension’? Yes, more or less. Loosely taken, anxiety and tension are one and the same. If we were to turn this loose term into one with a clearer definition, we could give it a particular and a useful meaning. Let me explain it first. Take a look at the last symptom in the table above. The physical change that takes place is an increase in our muscle tone. Our limbs would stiffen a little and may even tremble slightly. We could describe this condition alone, if it pleases us, as tension. Thereby tension would be a symptom of anxiety, or a collection of such symptoms. And that could be the meaning of ‘tension’ in a more refined way. I understand. Could we then say that anxiety and tension are merely nuisances in our lives? No, not always. Just think what would happen if we experienced absolutely no anxiety. We would abandon preparing for an exam, not to mention many other things in life. In reality, anxiety is actually an important propulsive force in life. Sometimes however it is a bother. For example Kumudini could fail her job interview because of anxiety. She may not be able to respond suitably to certain questions not due to incompetence but because she was anxious. At the end of the interview she would feel that she could actually have faced it better. The table below will show you with examples how anxiety could become a nuisance. Suboptimal performance at exams and interviews due to excess anxiety. Inappropriate anxiety on contact with generally harmless things such as a cockroach, a worm, a spider, blood shown on TV, a knife lying on table in the kitchen. Sudden onset severe anxiety with no apparent cause; perhaps excessive anxiety experienced during bus travel for some. Anxiety which comes with symptoms of severe physical illness. Here the person may feel that he/ she is having a heart attack, or that his/ her breathing would arrest, or that he/ she is about to die. Various aches and pains which may cause multiple visits to several doctors and which could affect day to day work. Excessive anxiety lasting throughout the day; worrying about every little thing. What should we do about anxiety if it becomes such a problem? Anxiety may even resolve on its own. However if a situation has arisen in which you finally feel help is needed, and you decide to seek help, the first thing you should do is to get a diagnosis. For this you have to meet a doctor to get your symptoms looked into. You could meet your family physician or visit the out patients’ department (OPD) of a government hospital. In most probability you would be referred to a psychiatrist for specialist advice. On referral, in which way could we expect anxiety to be treated? The psychiatrist first has to decide whether treatment is indeed warranted. If needed there is a wide array of treatment options to choose from, as seen in the table below. Together with your doctor, you could select one or more of these. Getting to know about anxiety is one way of reducing it. Reading this post is one way of gaining such awareness. There are several drugs which reduce or cure anxiety. If you need to take medication however, you should do so strictly according to medical advice. Exposure: This method is highly successful in the treatment of pathological anxiety, and is often a definitive cure. Here you continuously face the anxiety-provoking situation without running away. Breathing exercises: Basic physiology tells us that symptoms of anxiety are aggravated during inhalation and relieved during exhalation. Several exercises that prolong exhalation and shorten inhalation have been developed on this basis. These could be very useful during an exam or an interview. Relaxation exercises: Relaxing one’s muscles is another way to reduce symptoms of anxiety. This involves relaxing targeted groups of muscles. 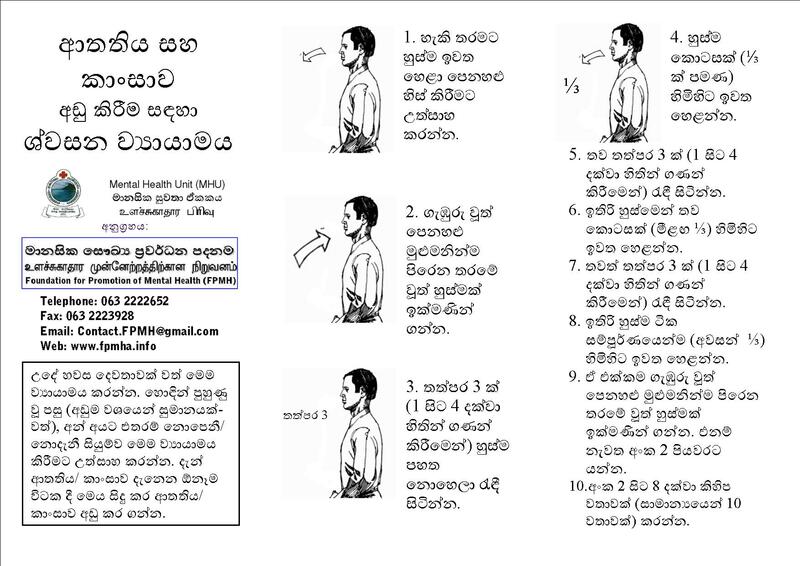 This is an effective form of psychotherapy for the treatment of anxiety, yet is available only in selected centres in Sri Lanka. Thank you for this basic introduction regarding anxiety. What is our next topic of discussion doctor? Let’s discuss another reaction to stress, namely depression. This artical is very useful. Thank you Dr. Mahesh & Dr. Geshan for the simple translation, from which we can understand very well. But cant find the Depression part. Is there another link to it? Please let us know. Thanks a lot. Will do the depression part in the future. Dear doctor, Thanks for the excellent,simple explanation. Could you kindly tell me that if some body says that he cant go to temple and see the Buddha statue and if he go to temple then he feel very bad, and also some times he looks here and there having little bit suspicious. Are those symptom related anxiety ? He is very clever in education but he refuse to go to school or term test. Thank you for the question. It could be an anxiety disorder, or perhaps another psychiatric illness. On the other hand he may not have an illness but going through a difficult time. The best way to sort this out is to see a psychiatrist near you. Since there is significant deterioration in his functional level, seeking professional help is recommended here.